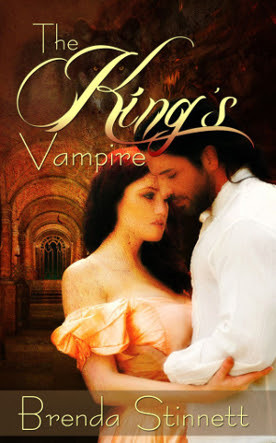 This week's spotlight is on Brenda Stinnett's The Kings Vampire. The priest pulled up a small Venetian table inlaid in gold, and covered it with a snowy white linen cloth before placing a silver candlestick on it. The crisp, cold sea breeze blew in from the Thames, causing the candle to flicker. He placed a jeweled rosary between Charles's long fingers. Then put a bottle of holy water, a silver salver of oil, and a silver-plated bowl on the table next to a well-worn wooden crucifix. "Bless me, Father, for I have sinned," Charles said. "I loved many women and committed much adultery, but the one woman I truly loved was my darling Elizabeth. Never would I have taken another woman if she were mine. The story I beg you to share with others is not my story, but rather hers, for she was the king's own vampire." The priest paled and stroked Charles's cheek. "There, Your Majesty, you are feverish. Don't speak of this thing right now." Charles drew in a painful breath. He had to make the priest understand before he grew any weaker. "My Nelly told me the parts of the story I didn't already know, and as for the rest, well, I was there. It's a story that may frighten you, but it's a warning to all--because it could happen again." That's my snippet from The King's Vampire, and I hope you liked it. Thanks for stopping by for SMP's Thursday Threads.